Within your brain, nerve cells called neurons signal to each other forming connections that enable everything from bodily movements to thoughts and emotions. These networks are ‘roads’ of sorts and the more often they are used, the more established they are in the brain – just like a road or path becomes worn over time. There are different ways neuroplasticity works. Your brain can form new connections, produce new cells as well as sculpt existing connections to be more efficient. 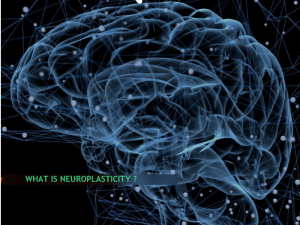 Because our brains at birth contain many more cells than we need for optimal functioning, sculpting is the most common form of neuroplasticity as we develop. This is the brain’s way of being efficient and losing cells from pathways not currently in use. Keep in mind that neuroplasticity is not good or bad; it is neutral and always happening. However, through our work we are learning we can shape our brains in more adaptive and beneficial ways by cultivating healthy habits of mind. The invitation is to use these insights to cultivate well-being in your own life. When given a challenging situation your brain has not encountered before, it can reorganise and restructure to respond to that situation. The more often your brain is exposed to that new challenge – like learning to play a musical instrument for instance – the more it reorganises and makes that path more established. In addition, the more often your brain is exposed to difficult emotional challenges that are successfully navigated by healthy forms of emotion regulation, the more stable and enduring the neural pathways will become that promote well-being. Your brain changes throughout life, but there are sensitive periods of development when the brain is more pliable – between birth and 2 years of age, between 4 and 6 years of age and around puberty. Our brains are constantly being shaped wittingly or unwittingly – most of the time unwittingly. Through research the possibility exists of intentionally training our brains to improve our well-being. A growing number of studies explore interventions to help individuals with various mental health challenges. We know mental training can shape the brain for greater well-being, but what about the greater good ? Research, suggests that pro-social skills such as empathy, compassion and gratitude can also be trained. Even more, we are learning that focusing on the well-being of others and relieving their suffering is crucial to improving our own well-being. It turns out changing your mind can contribute to a kinder, wiser, more compassionate world.